Antennas of the Allen Telescope Array have been used to study signals from remote galaxies, supernova remnants, extrasolar planetary systems, and the interstellar medium. Each antenna is about 20 feet wide. A new contracted job is to assist the U.S. Air Force in situational awareness and detect space debris. Editor's Note: The deadline to contribute to Uwingu's IndieGoGo campaign has been extended through today (Sept. 24). With government funding for science and spaceflight waning these days, a new start-up hopes to fill the gap by providing private funding for spaceflight, space research and education. Only five days remain in an online campaign to raise seed money for the company, called Uwingu ("sky" in Swahili). Uwingu was founded by astronomers, planetary scientists, former space program executives, and educators with the goal of creating a new channel for funding space projects. The start-up is headed by Alan Stern, a planetary scientist at the Southwest Research Institute and the former associate administrator for NASA's Science Mission Directorate. 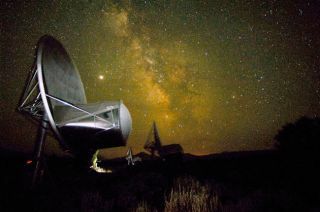 The firm announced recently that its first large donation will go to the Allen Telescope Array operated by SETI (Search for Extraterrestrial Intelligence). The array is a collection of 42 radio dishes in Northern California built to scan the skies for extraterrestrial signals. Uwingu aims to raise money through private donations, as well as through sales of to-be-announced products on its website. "We're planning a series of projects at www.uwingu.com that will earn revenue to create a new, private sector funding stream of millions or even tens of millions of dollars annually for space projects of all kinds," company officials said in an update. An initial campaign is underway at the crowdfunding site IndieGoGo to raise money for Uwingu's start-up costs. The drive had raised $39,929 of its $75,000 goal as of press time. The campaign is due to expire Friday (Sept. 14) at 11:59 p.m. PDT (2:59 a.m. EDT Saturday), at which point Uwingu will get to keep all donations raised so far. The new startup company Uwingu aims to offer an alternative funding source for space projects. "According to IndieGoGo, most crowdfunding campaigns see a steep uptick in their final days, so we're optimistic we'll meet our goal," Uwingu officials wrote.